Friendly Encounters is a regular series in which I feature my friends who have met celebrities. With Flashback Weekend happening next weekend, this is a special Flashback Weekend Friendly Encounters. My bud Tony Feddeler has been a regular at Flashback Weekend for several years. It's always good seeing Tony, whether at Flashback, the Chicago Bandits or anywhere else. He's a great guy and a lot of fun. At Flashback Weekend several years ago, he met actor William Forsythe. Now that's a pair of legends. Forsythe has had many television roles, but he really made his name in movies, with over 100 on his resume which stretches back 40 years. Raising Arizona and The Devil's Rejects are two of my favorite of his movies. I had the pleasure of interviewing Forsythe a few years back. 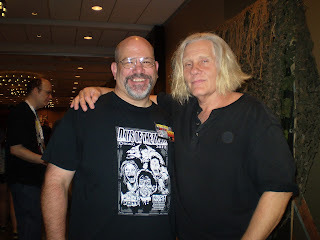 That interview can be found at On the Beat with William Forsythe. That was a real pleasure and he was super-nice. Flashback Weekend runs from Friday, August 3 through Sunday, August 5 in Rosemont. As usual, it will be full of celebrity guests, events and all sorts of fun. Go to FlashbackWeekend.com and the Flashback Weekend Facebook page for more information and updates. Forsythe will not be there, but plenty of other great celebrities will be. I'll be there, too. I hope to see Tony and several other friends there and we'll create more memories. Tony Feddeler and William Forsythe in Rosemont, IL-August 2013.